What do 3 dozen eggs, 3 bottles of honey, and a beautiful handcrafted dish have to do with garlic? In trade for garlic: pottery, honey, eggs. Yes! We love all these things! 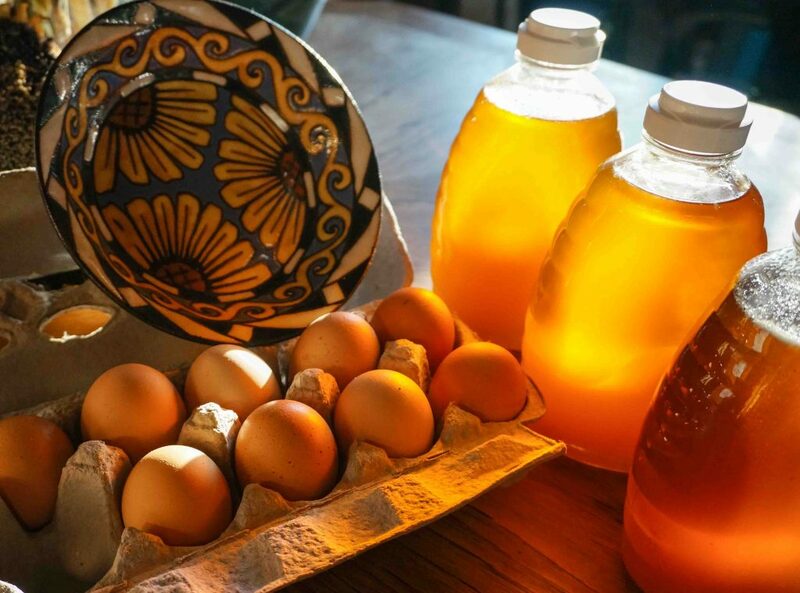 This picture is of my three most recent trades: a pottery dish made by Linda R. Hughes, three bottles of raw, unheated honey, and 3 dozen fresh eggs. Quite an assortment! And each one special in its own way. I keep going back to the dish to hold it. 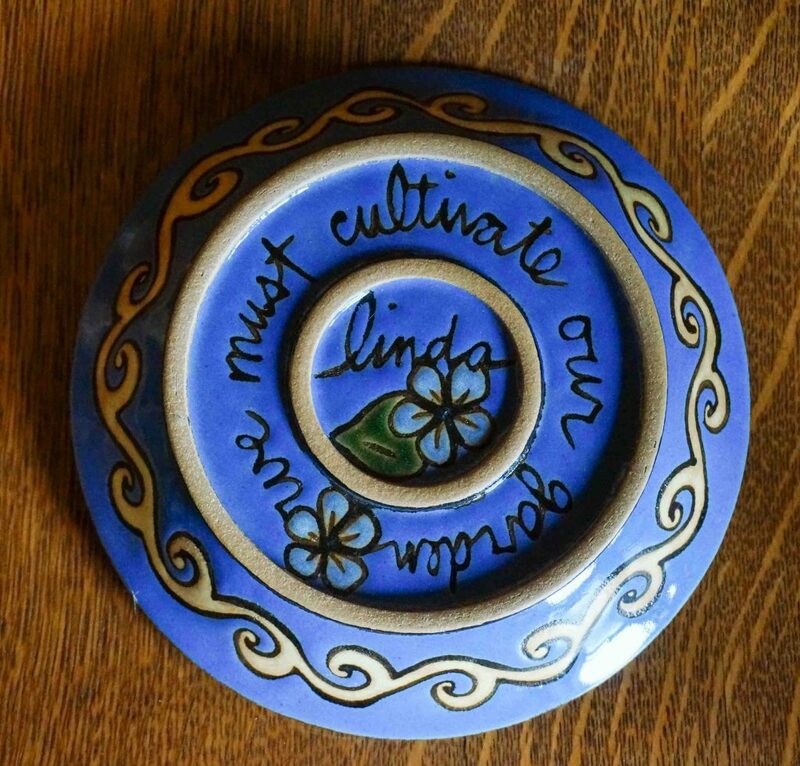 On the back is the inscription, “We must cultivate our garden.” How very fitting! Knowing that I am holding what was once a simple lump of clay, shaped by the loving hands of its creator; understanding the concentration and steadiness it must have taken to paint geometric symmetry and a little bit of whimsy, and in the process, achieve such balance and a feeling of fluidness; I am speechless by this simple form of combined elegance and utility. I feel I am looking up at my favorite flower reaching down to me from a deep blue sky. It makes me happy. And it also makes me happy to know that in exchange, Linda is planting some of my very best garlic bulbs, which I hope will nourish her family and produce for many years to come. And aaahhhh – the honey! I was caught by surprise when I received the heavy box via carrier. Inside, not one, not two, but THREE full bottles! Look how they glow in the morning sun! Gorgeous! I have not harvested honey from our bees yet, other than a small amount from the original hive that did not survive their first winter. I had fed them sugar syrup to help them get through, so I can’t consider it true honey. But this – this is real, crushed-from-the-comb, unadulterated, pure honey – one of mankind’s oldest of medicines – and quite possibly the best I have ever tasted. This is something that thousands of bees made thousands of trips to the fields and back to produce. It’s almost mind-boggling to think that a worker bee may only produce 1/10th of a teaspoon of honey in her lifetime; it may take 10,000 of them, flying over 55,000 miles, to produce 1 pound of honey! (How do they calculate these things?) In the traditions of his father and grandfather on an old family farm, my friend, Jeff, tends 11 hives, taking just a minimum of honey to leave the bees more than enough to make it through the winter – “My goal is to leave the bees with more food than they need and also have extra in the spring so I do not have to feed them; the best food for them is their own honey.” Amen! That sounds like a good approach to sustainable beekeeping to me! Such an interesting relationship we have with Apis mellifera, our beloved honeybee, representing skills passed down through generations. Again, a gift so much more than the thing itself! And then the eggs – wow – how I miss our chickens! “I am very proud of my girls,” she said with a smile as we exchanged our goods, and I can understand why! Nothing quite like a fresh egg from a healthy hen who is allowed to forage in the backyard for bugs and shoots and scraps of this and that. The yolks are deep orange and stand up tall in the pan. The whites hold together, clear and firm. Eggs from happy hens allowed to run and peck around have more vitamins A, D, and E, Omega 3s, beta carotenes, and who knows what else, but safe to say they are a lot better for you and sure as heck taste a lot better! Thank you, ladies, for all your hard work! In the past few years, we are seeing a new economy emerge – perhaps a movement of sorts that I personally relate to from my life in the 70s – one that is deeply connected to the earth, self-sufficiency, living simply – a life not so unlike that of our grandparents. As my father recently told me, “If we didn’t garden, we didn’t have much to eat.” And as much as our world has changed into a technological whirlwind that makes all things seem possible (and don’t get me wrong, I love technology, too! I just try to keep in perspective what I really need), certain things still remain the same. These are the things that keep us grounded. Emerging from this “newfound” awareness that is not new at all, is the awareness of the importance of human connection, which gives meaning to most everything else. As the stock market jumps and falls repeatedly, as the government is mired in argument, as companies cannot invest in a future out of fear and uncertainty, and as people lose their jobs and education seems more and more out of reach – a new economy emerges along with a new mentality – one based on can-do attitudes, the recognition that learning is a way of life, and most importantly, one based on relationships, where trust and keeping true to one’s word are valued more than profit, and a desire to support one another not only helps out a friend, but also strengthens an entire community. This human connection, the power of friendship, and the value of things handmade and food homegrown, where knowledge and skills are freely exchanged, is the new economy. There is something very empowering about removing ourselves from the dependency on the dollar. I think I will have to keep growing garlic into my old age not only because I am so spoiled at having such fantastic garlic at my disposal, but also for the joy of trading. Yes, cold hard cash comes in handy, too, and we do need it in the world we live in. But trading comes from the heart. A barter helps you to appreciate the true value of the thing. For what it’s worth.